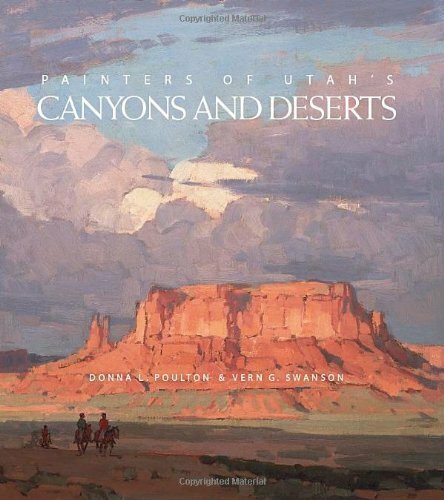 Painters of Utah’s Canyons & Deserts, a collaboration of art historians Donna L. Poulton and Vern G. Swanson, is a wonderfully written and illustrated book about artists painting the southern Utah landscape. The book is a suitable companion to other publications about Utah art and artists, the previous book entitled Painters of the Wasatch Mountains by Robert Olpin, Ann Orton and Tom Rugh. Artists, photographers, writers, and poets were not the first to discover the canyon country of Utah’s plateau province, but they were the first to speak to the beauty and wonderment of this expanse of exposed rock, rugged land and deep canyons. Indigenous people have used images from this region to record their experiences on the red rock surface known as petroglyphs, and to enhance their utilitarian objects of pottery, baskets, rugs and dress. The book gives reference to this early artform complementing the following text of artists giving visual image to the canyons and deserts of southern Utah. This book is a testament to the land and places seen through the eyes of artists beginning in the 1800s and carrying through to the present. The impact of Utah’s canyons and deserts on the artists is documented through images, diaries and letters collected and sensitively presented in this publication. The three major sections with their subcategories, cover the period from 1848 to the present. Beginning with the survey artists who accompanied exploration parties and visually recorded the unknown regions by first drawing and later painting and photographing this region of rugged and unimaginable beauty. Powell had intended to have photographers record his river expeditions and the accounts of the difficulties of transporting cumbersome photographic equipment and getting images on glass plates is a fascinating story. Photographer John (Jack) Hillers became a member of Powell’s second expedition (1871-72). Hillers photographs were the first to be viewed from the canyon floors. Utah artists Alfred Lambourne and George Ottinger and photographer C.R. Savage had documented the area earlier in 1870. The early Utah artists began to view this southern region through the eyes of the expedition and visiting artists. These early painters found the lure of the vistas and vast, desolate spaces and deep canyons a subject for pictorial expression. Once the southern Utah region became more accessible, the artists found endless areas to depict on their canvases. The artists became intertwined with the canyons and deserts and found philosophical questions to ponder and express through their art. Part II: Utah’s Plateau, Parks & Monuments, 1900 – Present, addresses the increasing number of artists who have acquired training from established sources in the United States and in Europe. By the turn of the 20th century, settlement and the establishment National Parks had defined the areas of the southwest region. Zion, Bryce, back country arches, natural bridges and monuments were being painted and photographed in increasing numbers. The magic and beauty of this phenomenal land appealed to the artists for their interpretation from the most literal rendering to idealized and abstracted forms. Part III: Utah’s Continuing Allure, 1960 – Present, brings a variety of artists and art styles to the region, each expressing a unique view of the canyons and deserts and the impact of settlement and commercialization of the land. The plateau region houses many contemporary artists working in traditional styles and techniques and many interpreting another vision of this area. The variety of styles and techniques are unique messages by artists living, visiting, painting and photographing in this region that was once so remote and inhospitable. The overwhelming effect of Utah’s canyons and deserts is such that Robert Smithson, the creator of the Spiral Jetty in the Great Salt Lake is quoted, “The landscape [of southern Utah] is so overwhelming that there is no way that I can make an impression on it.” Indeed, it is the artist’s challenge to sense the significance of the aesthetic experience. The text for this book is informative, very well written with interesting stories of historical events and experiences that tie the artist to the visual work. The biographical information is equally enlightening complementing the colored reproductions. After all, a book about painting is not interesting without visual reference. This book will serve as a reference to the history of artists painting in southern Utah, as well as a document that can be enjoyed and savored for a long time.